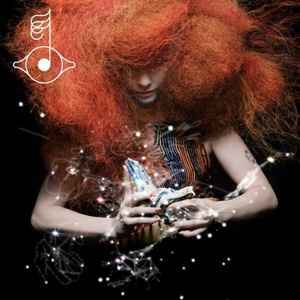 The 2nd single from "Biophilia". Released digitally on 19th of July. "Cosmogony (Matthew Herbert Mixes)" on CD and 12" vinyl as released on 2nd of August: The CD version is the proper Cosmogony single, but the vinyl version, although coming with a unique Cosmogony Cat#, is also a Part 4 of The Crystalline Series. My copy has a white sticker placed over the bottom of the pink sticker, reading "4 in a series of 4, 0-528690" and a new barcode. Cosmogony contains the edited Instrumental from her earlier released "Solar System" song. It tells the story about various evolution theories. Her voice is joined by choir and dub bass lines. And it is one of the songs which Björk has edited for the final album release.